Come celebrate the cultural diversity found among our students and their families on Eastshore’s playground. Meet new friends and enjoy old ones, while you explore toys, games, and sample dishes from around the world, prepared by you and other Eastshore Families. POTLUCK– All you do is bring a large platter (15-20 small servings) of your favorite dish representing your family’s heritage. (homemade or store-bought). Label your platter with your last name. Please have a light dinner beforehand and leave some room to sample the dishes. TOYS & GAMES– You are also welcomed to bring toys or games originated from your family’s heritage. (labeled with your last name) Let’s all have fun!! FASHION SHOW– We will have an “International Fashion Runway” at 6:45 p.m. where your children can represent their cultural heritage by dressing up in native traditional outfits. 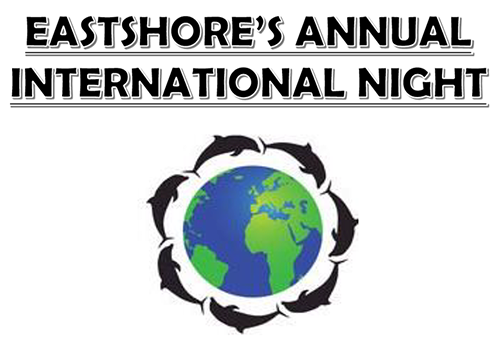 Please see the International Night Flyer for details. We need volunteers to keep this wonderful tradition going! If interested, please email Shelby Wu at shelbywure@gmail.com or Lindha Larsson at lindhis@yahoo.com.